Phrase business needs as answerable reporting questions. Explain the difference between a report, dashboard, and report type. Which products are my top sellers? Who are my highest value prospects? Which marketing campaigns have been the most successful? Original Question Which products are my top sellers? What makes a product a top seller, revenue or quantity? Do you want to see the results grouped by product family? What is your date range? If we stop selling a product, should it show on the report? “Top sellers” here means quantity rather than revenue. Group products by product family. Show all Closed Won opportunities. Do not show inactive products. Now at this moment, you might be looking at that Criteria column and thinking, what does all of that mean? Rest assured, we’ll cover those topics in detail as you work toward earning your badge for this module. The point is, most people at your company will come to you with questions just like these. Here are some typical examples. An Account Executive planning the day’s calls, who wants to identify which prospects to contact first. A Support Manager analyzing deflection rate month-over-month since rolling out that self-service community last summer. The CEO, busily crafting the company’s annual plan, and making decisions about where to take the company next. For each of these scenarios, a report or dashboard can provide the insight each team member needs to take action and go big, whether it’s that day, month, or year. You can be the person who translates their question into the report or dashboard they need. Read on to learn how to get started with reports and dashboards for your company. A dashboard is a visual display of key metrics and trends for records in your org. The relationship between a dashboard component and report is 1:1; for each dashboard component, there is a single underlying report. However, you can use the same report in multiple dashboard components on a single dashboard (e.g., use the same report in both a bar chart and pie chart). Multiple dashboard components can be shown together on a single dashboard page layout, creating a powerful visual display and a way to consume multiple reports that often have a common theme, like sales performance, customer support, etc. Like reports, dashboards are stored in folders, which control who has access. If you have access to a folder, you can view its dashboards. However, to view the dashboard components, you need access to the underlying reports as well. You can also follow a dashboard in Chatter to get updates about the dashboard posted to your feed. Each dashboard has a running user, whose security settings determine which data to display in a dashboard. If the running user is a specific user, all dashboard viewers see data based on the security settings of that user—regardless of their own personal security settings. For this reason, you’ll want to choose the running user wisely, so as not to open up too much visibility. For example, set the Sales Manager as the running user for a leaderboard for her team. This allows her team members to view the leaderboard for their individual team, but not other teams. Dynamic dashboards are dashboards for which the running user is always the logged-in user. This way, each user sees the dashboard according to his or her own access level. If you’re concerned about too much access, dynamic dashboards might be the way to go. What is a report type? A report type is like a template which makes reporting easier. The report type determines which fields and records are available for use when creating a report. This is based on the relationships between a primary object and its related objects. For example, with the ‘Contacts and Accounts’ report type, ‘Contacts’ is the primary object and ‘Accounts’ is the related object. Reports display only records that meet the criteria defined in the report type. 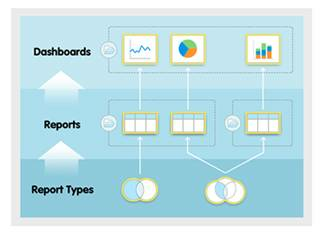 Out of the box, Salesforce provides a set of predefined standard report types. Don’t see all the fields you want? You might need to create a custom report type. For example, an administrator can create a report type that shows only job applications that have an associated resume; applications without resumes won't show up in reports using that type. An administrator can also show records that may have related records—for example, applications with or without resumes. In this case, all applications, whether or not they have resumes, are available to reports using that type. An administrator can also add fields from a related object by creating a lookup relationship to that object, allowing for even more reporting possibilities.